I bought these SuperHeros figures at a carboot. At first I thought they were the real thing as they looked like Lego and were well made. It does not say Lego on the bricks, so maybe not fakes just copies. Normally I can tell non-Lego, but these fooled me. Is there a real Winter Soldier minifig? There is a whole thread on these fakes. They are relatively easy to spot in hand, from the print quality. And also the lack of the logo. He has a golden eyepatch. They are relatively easy to spot in hand, from the print quality. And also the lack of the logo. So it is not a question of looking at them. If you see figures that look like Lego, you dont study them indept. It was later in the day I noticed minor differences. To a child these are Lego figures. You should always look closely at lego minifigs bought at a boot sale. Especially when they are selling comic con minifigs. I'd have taken a good look at The Hulk at a boot sale. The comic con ones I wouldn't have bothered looking at, as they are obviously going to be fake at a boot sale. What plates are they on? Are they Lego or the printed super heroes ones? I was hoping nobody saw those. 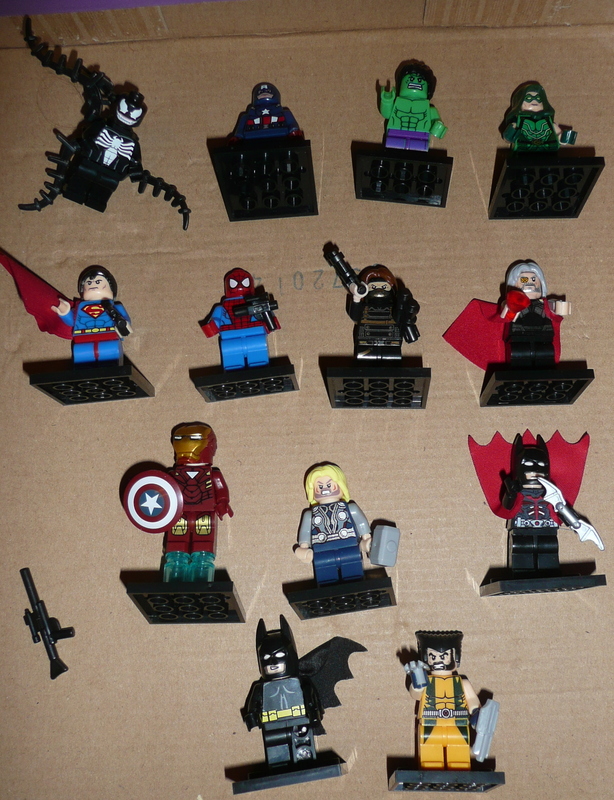 They are all fake, but some have "World minifigures Collect them all" printed on them. That should have been a give away, but I looked at the faces, hair and so on. They did look geniune, but small details like feet are different. I will have to be carefull next time. The legs and feet are almost always shaped differntly, so those are a dead giveaway as well and easy to spot. Or maybe the Batman that has 2 right legs. How much did you pay for these or are you embarrassed to say? Did the person who sold them to you tell you they were Lego or dod they play stupid? The plates are the biggest giveaway - if there are non-lego plates with them it should at least prompt you to look closer. Oh well, live and learn - assuming you have not paid comic con prices for the fake rare ones. @akunthita 3 of the feet are shaped like Lego, the rest have a small curve. ^I don't think anyone is laughing. We all make mistakes while either buying or selling. Selling something far below its value because you don't know what you have could be considered just as bad as buying something you thought was a good deal. I doubt they are from the same factory. There are other differences too. These will probably have sharper shoulders, some have the different feet. Some have different pins in the legs, etc. They are just cheap knock-offs that unfortunately have been plaguing ebay for some time now, and it was only a matter of time before they turned up as second hand items at other sales. No doubt some sellers know what they are selling, but I'm sure some sellers will believe that they have lego when they haven't. I have compared at the figures with Lego ones, and I must say there is little difference. The colours are the same, the hair looks right, some of the legs look the same. Not identical, but I would be surprised if the factory Lego uses did not also make fake ones. It is not like Lego own the factory. Getting the molds to make figures cant be that difficult. The quality of the plastic is sometimes a giveaway. The CMF's are of lower quality, but Superman should be good quality. I guarantee these are coming right out of TLG Chinese factories without them knowing or not caring. Any company opens the door to this when they move production to China. So theoretically are they really fakes? They are non Lego licensed figs but they are made from the same moulds, same plastic, and same screen prints. Things that make you think. If they are made using the same molds, then why no Lego mark on them? Are the fakers removing it by hand? I somehow doubt it. If you know what you are looking for, there are differences. You need to bring a loupe to the carboot sales, so you know what to look for. Newer Lego Minifigures have Lego on the inside of both feet. The older Lego Minifigures don't have any. The Newer CMF'S have only one foot with Lego on the inside, but I cannot confirm if everyone does. I have Emmet in front of me and he only has Lego on the inside of one foot. Can someone confirm if any of the others do? I doubt there is a problem to remove a logo from a mold. Would not surprise me if a couple of molds have gone missing. Maybe they "break" more often in China than in Denmark, who knows. But it is fantasy to believe that fake Lego is made in a dimly lit factory in a remote part of China under cover of darkness. ^ no it's not. When my wife was involved in starting up a Chinese cosmetic factory she was told that before their production lines left customs the Chinese would have copied everything. They would then put them in an empty factory and effectively have cloned the official factory. They would be able to see all the materials going in and as the titular factory manager would have to be Chinese could get other information to. Its possible that the nature of the moulds means they're the one thing LEGO can maintain some control over which would explain the slight differences.